Participants of women with disability trainings. The NCDA conducted series of Training on Gender, Disability, and Leadership Development for 2017. The training was participated in by persons with disabilities especially women with their respective PDAO/focal persons. The training’s objectives were as follows: (1) to increase the awareness of participants on the rights and responsibilities of persons/women with disabilities; (2) To increase the awareness of LGUs in the importance of their roles in achieving the objectives of the government in attaining the goals of UNCRPD; (3) To develop the particpants to become active members and leaders of their organization; and (4) To enable them become advocates for persons/women with disabilities’ rights and assist their localities in the promotion of the UNCRPD. 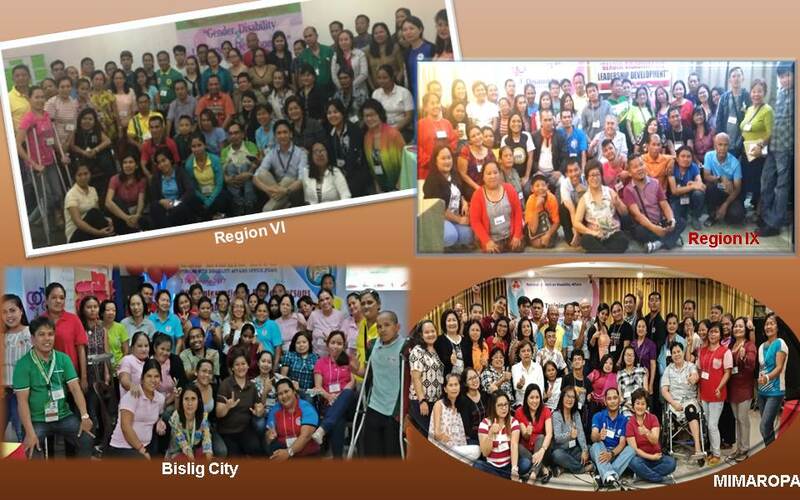 From the top left: Fifty-four (54) participants from the Provinces and Cities of Region 6 attended the training held last March 14-16, 2017 at the Gov. Cabagnot Tourism and Training Center, Aklan; Sixty-three (63) participants from Zamboanga Peninsula (Region IX) attended the training held on 7-9 November 2017 at the Guillermo Hotel, Pagadian City; Training for MIMAROPA group was held at the Bayview Park Hotel on 27-29 November 2017, forty (40) participants attended the training, and on 6-9 December 2017 the City Government of Bislig sponsored the conduct of training held at the OSCA Conference Hall which was attended by fifty (50) participants.